Last year, one of the most impressive concerts I saw was the Dragon Drop/Cheer Accident/Free Salamander Exhibit show in Indianapolis. I was particularly impressed by Cheer Accident, a band I had heard of for many years but never given enough attention to, partially because of their immense discography and almost 40 years of material. They had just released their 18th studio album, Putting Off Death, so I figured that it was time I drove out to see them live. To put it simply, Cheer Accident blew me away. I left that show feeling that my inner artist had received a swift kick in the pants. The music was innovative and powerful and brave and everything I’d hoped it would be. I was thrilled to dig into their latest release, Putting Off Death, soon after. Album opener “Language Is” begins contemplatively, with an ephemeral sounding piano accompanying drummer/singer Thymme Jones’s tender voice. 4 minutes in, the song breaks into a dissonant, stilted mid-section, then launches into an ethereal soundscape, only to close with jarring radio static. “Immanence” features a lovely and melodic vocal passage, which break into counterpoint near the end of the song, to the bed of Thyyme Jones’s unusual drumming. “More And Less” plays to a groovy ostinato in odd time, featuring xylophones and brass instruments, to the backdrop of dissonant chords and an interesting beat. “Lifetime Guarantee” opens triumphantly and cheerfully, making the listener think it will be one of the more straightforward tracks on the album, only to jump into a Zappa-esque freak-out. The final track of the album,”Hymn” closes the album where it opened, in a contemplative, thoughtful, and quieter place. As I’ve continued to dig into their back catalogue, I’ve come to the realization that Cheer Accident is a criminally underrated band. Their dedication to writing boundary-pushing music over the last three decades deserves recognition, and is definitely worth the attention of any fans of progressive music, or art rock, or avant garde, or whatever other genre label or title fits best for music that is patently uncategorizable. 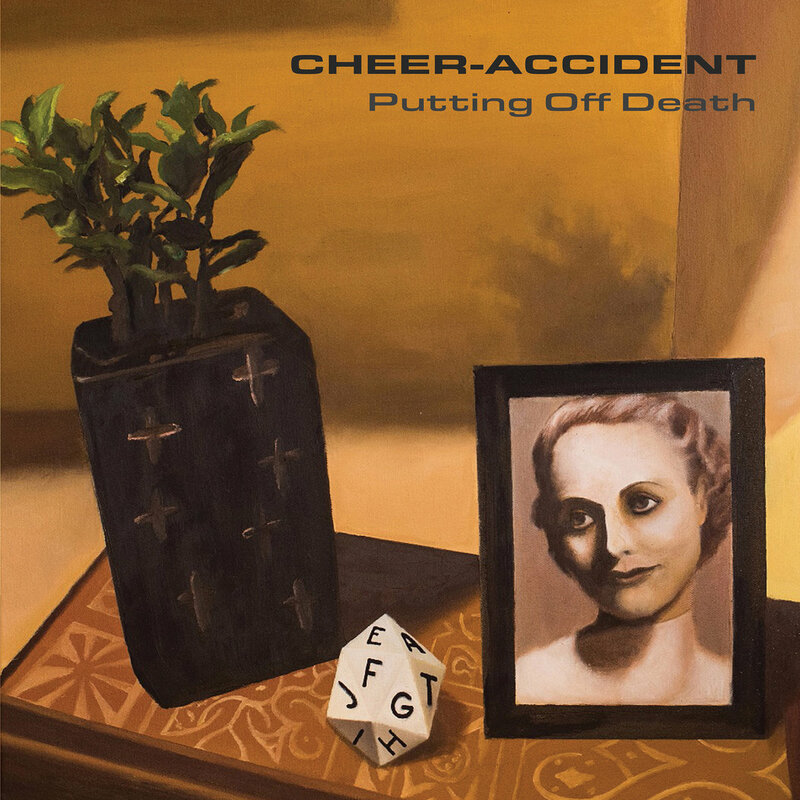 While I can’t definitively say yet that Putting Off Death is a great entry point for Cheer Accident (as I am still wading through their back catalogue), I think it’s a terrific, challenging, interesting collection of songs that is worth your consideration. Cheer-Accident’s Putting Off Death was released on May 12, 2017 through Cuneiform Records. Buy it here. Tags: avant garde, cheer accident, cuneiform records, putting off death, thymme jones. Bookmark the permalink.